The new baby hybrid in the Lexus range uses the same compact platform underpinnings as the Toyota C-HR. 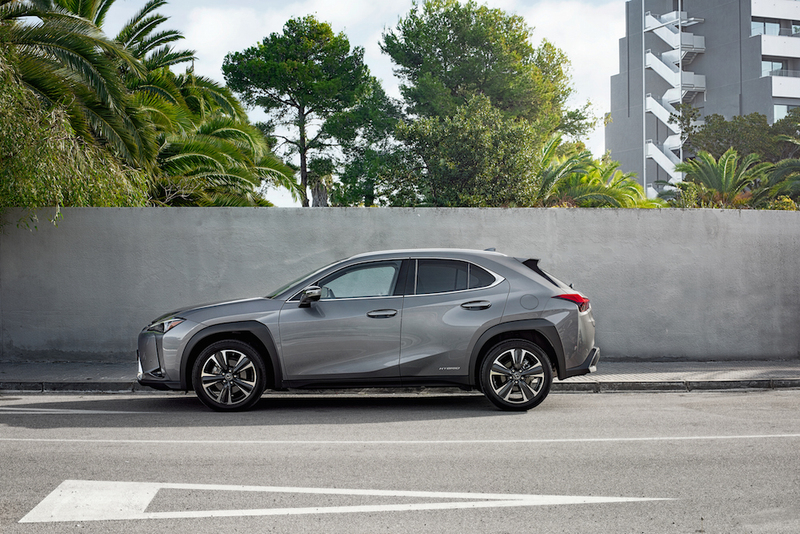 The UX name is meant to instantly make you think of urban crossover but UX doesn’t roll off the tongue in the same way other Lexus nameplates do. 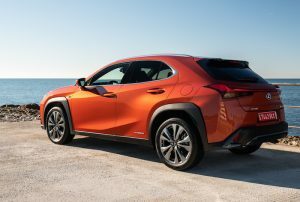 In Ireland the new compact crossover starts from €40,200 – so the qusation is can it can justify the premium price tag? Ireland buyers get one powertrain: a 1987cc petrol hybrid with a CVT automatic transmission (C-HR has a 1.2T manual or 1.8 hybrid). When it comes to premium machines the cabin ambiance must be excellent and near silent. The elephant in the room with UX250h is the fact it has a CVT automatic gearbox. Despite engineering improvements the CVT still makes an unpleasant whining engine sound when accelerating hard. To be fair the sound is far less intrusive than early CVTs and for many drivers its not an issue especially when you factor in the efficiencies a constantly adjusting gear delivers. Fuel consumption is a modest 4.1L/100km NEDC (5.3 WLTP) and emissions are just 94g/km CO2 NEDC (120g/km WLTP). The total system power output (petrol engine & electric motor) is 185hp. Outside the UX is instantly recognisable as a Lexus with its huge corporate grille. The front end is aggressive and perhaps a little too much for this class when you see cute and disarming rivals like the Audi Q2, BMW X2 and Mercedes GLA. I mention these three as they are the most crossover-like competitors. The Volvo XC40 and Jaguar E Pace look that bit more SUV like whereas the UX is in the flesh more like a high rise hatchback. If you park the UX next to its stablemate the Toyota C-HR (hybrid from €31,310) you will find it hard to justify the additional spend. 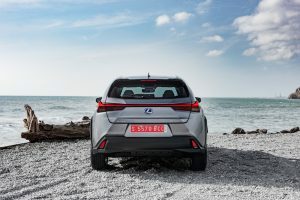 The C-HR (1.2T from €27,170) has been a huge success for Toyota and its styling outside and in have been key to this. The UX has lots of nice detail plus a few that might take a while to get used to like the fins in the taillights. The rear view is my favourite as the tailgate is a lovely form and the new single light-bar tail lights look pretty cool too. The F Sport grade (from €46,395) gets unique 18 inch alloys with 225/50 tyres, different bumpers front and rear and a mesh grille. It is available in most markets in FWD or AWD – in Ireland the FWD is only being imported – for now. Inside the cabin is seating for five. Remarkably we managed to fit five of us (men) in to it for a brief airport transfer – yes it was quite cosy. The cabin is compact and with three grades available the level of premium comfort is impressive too. The entry ‘S Sport’ (17” alloys) will account for 40% of sales, Luxury (50%) and F Sport (10%). The big seller Luxury (from €44,950) gets 18 inch alloys all the toys including a large HUD head up display as standard so you can guess that the rest of the equipment available is impressive. The secondary controls are accessed through some switch gear that falls short of being truly impressive. The Lexus trackpad mounted beside the automatic gear selector lever is not yet up with the best of this type to use. The F Sport’s interior is better suited to the car’s compact yet fun design brief. F Sport has a more focused style with gear shift paddles as standard and drilled pedals. From the drivers seat this version feels more in line with the hot hatch feel Lexus was after. The UX is a small car and the boot is particularly small. Irish cars get an inflation kit – so no spare wheel. Golf clubs I am told will fit but the boot at its floor level is very shallow and for larger cargo seats ay need to be folded. On the road Lexus wanted the car to handle like a hatchback and yes it handles like a pretty average hatchback. There is a nice tight turning circle and the car is super maneuverable. The ride in the Luxury grade doesn’t feel overly sophisticated and is soft. When cornering there is noticeable though not excessive body roll. The feeling is behind the wheel is pleasant but there is no eagerness of sense of purpose delivered to the driver. 0-100km/h takes a brisk 8.5 seconds. Like all Lexus models its is an effortless driving experience that you end up almost taking for granted. The AWD F Sport I test was far more entertaining and its firmer suspension (adaptive) is truer to the premium sector. 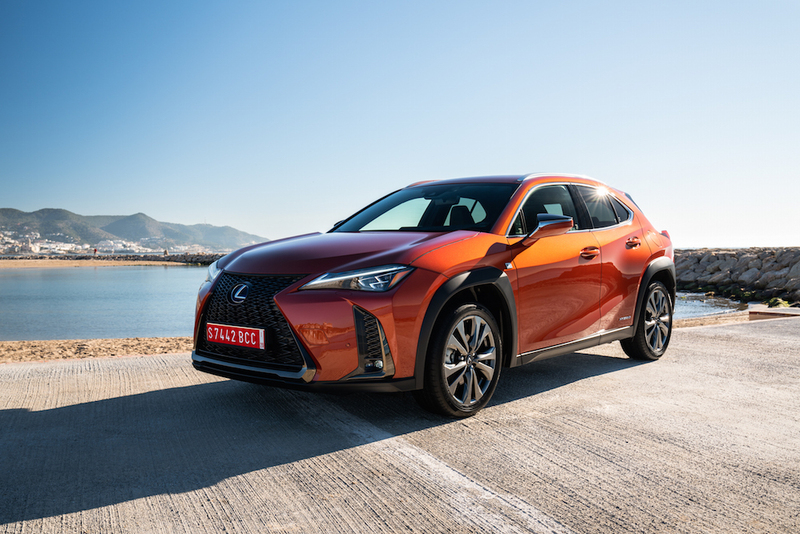 The Lexus UX250h arrives in late march and so misses the big selling period of January/February . Lexus Ireland expects to sell 80 units in 2019 to mostly urban buyers. The car gets lots of passive and active safety features as standard that help bring the asking price in to proper perspective. The hybrid’s battery pack comes with an eight year warranty and the car gets a three year one. 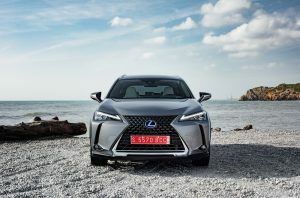 Lexus has four dealers in Ireland at present; two in Dublin and one in Galway and Cork. 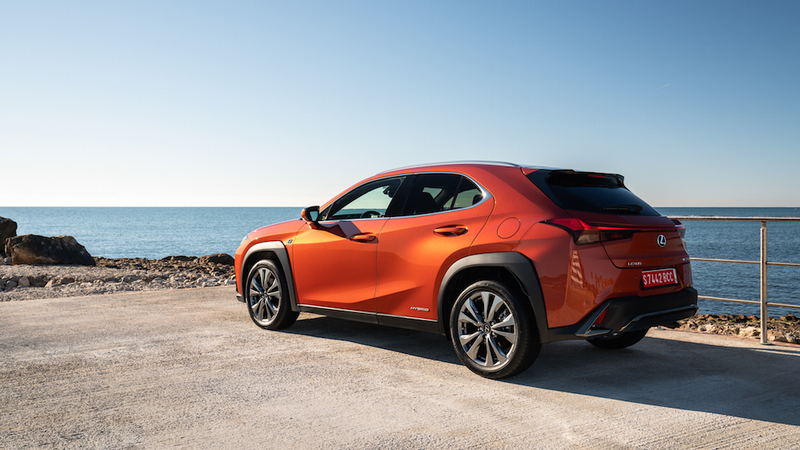 The Lexus UX250h has a tough job to do with such talented rivals but it is the cheapest access point to a Lexus crossover and for many it will be the perfect starting point. Michael is Motorhub's Editor. Well known from TV and radio, Michael has been writing, presenting and judging cars since the mid 90's. He is a renowned Producer/Director and documentary film maker. Dozens of credits include: The Whole Way Round (Gay Byrne), The Shamrock Run (Alan Shortt), The Viking Run (Clodagh McKenna) and The Irish 66ers (David Mitchell) and The Climb for Kids (Colin Farrell). Print credits include: the RTE Guide (motoring editor 1999-2003), many national daily papers and Sundays including The Irish Times (freelance) plus other magazines. National radio credits include multiple at RTE Gerry Ryan show, the Mooney Show, The Dave Fanning Show, Drivetime etc. TV credits as a motoring expert include RTE's flagship current affairs show Primetime and TV3's Ireland AM. Michael also presented RTE's car show Drive! in the late 90s and directed some items in MPH2 on TG4. Michael contributes weekly on motoring issues to The Last Word show with Matt Cooper on Today FM. Michael has represented Ireland's motoring journalists in Motorsport at the International Mazda MX-5 endurance race series in Italy and the Arctic Ice Race. He has been a Car of the Year Judge for over 18 years and is a former Chairperson of the Association of Professional Motoring Press (APMP).